Wireless cameras and vehicle links. 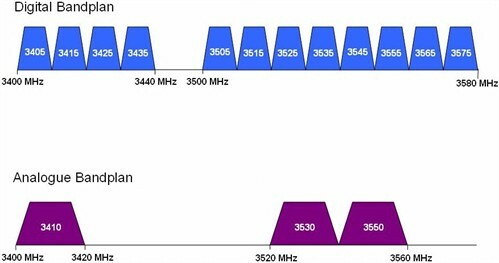 The bands 3480 - 3500MHz and 3580 - 3600MHz are used for wireless broadband in the UK. Analogue links are permitted to occupy a part of the programme making band that avoids harmful interaction between programme making and wireless broadband.